Nage assumes sankyo (page 113) and imagines ki flowing in a cirai around the arms, clockwise or counterclockwise. 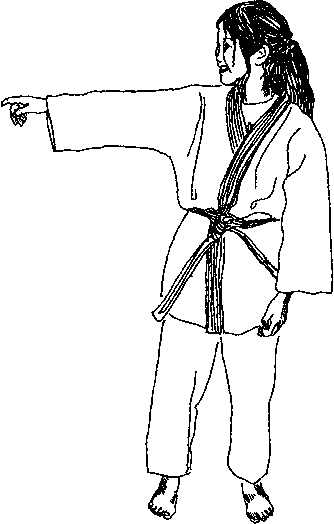 Nage vary these two possibilities with a third: ki expanding from One-Point outward in all directions. Uke test. 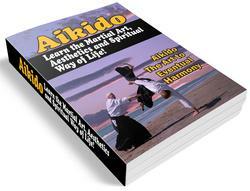 ma of the most difficult concepts in Aikido is to "go with" the offered ^ or attack rather than resisting or fighting it. 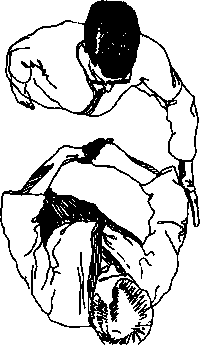 These exercises demonstrate the power behind blending" rather than attempting to muscle one's way through the technique. to groups of three, with a jo (staff or a broomstick), t -jtyo «¿es pull on opposite ends. 2. in middle pushes stick in one direction or the other. 3- Observe the effort required to move the> or an uke by joining with the other. Does this change with attempt to move the jo rather than the 2? Opposing the actions of uke 2. Helping uke 1 do what he is already doing.